Deepika Padukone's Recent Magazine Cover Proves That She's The Biggest Newsmaker Of The Year! Deepika Padukone’s Recent Magazine Cover Proves That She’s The Biggest Newsmaker Of The Year! The Biggest newsmaker of the year, Deepika Padukone rocks the new Filmfare’s magazine cover. 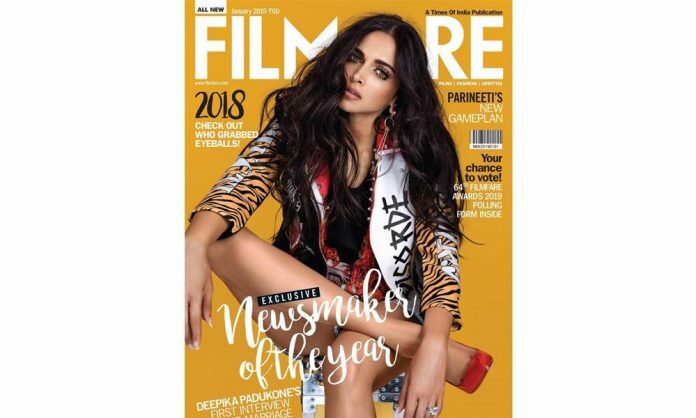 In the recently released Filmfare magazine cover, Deepika Padukone looks sensational as She is effortlessly seen sporting the urban-cool chic look. Looks like Deepika Padukone is not going to stop giving us fashion inspiration anytime soon. Be it bridal fashion goals or western ones, the diva never fails to disappoint us when it comes to fashion. Early this morning The actress moonwalks into 30 million followers on Instagram, where she posted a cute moonwalk video on her official account.